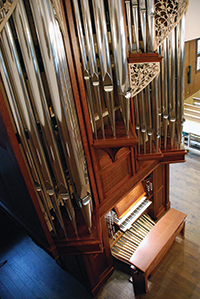 The Institute of British Organ Building is the professional association for those involved in making, restoring, rebuilding and maintaining pipe organs in the UK. The work of our members is diverse, and a number of firms operate overseas. More than 35 businesses are accredited members, ranging in size from 1 to 50 employees. We also welcome anyone interested in the British pipe organ, either as individual or subscribing members. The Institute was established in 1995, to represent, inform, serve and assist organ builders and their suppliers, and to encourage the improvement of skills and standards within the profession. Publication of the Register of Accredited Business Members is one of the most important services we offer. Accreditation follows an inspection of work in seven categories, and is repeated every seven years. The Register is made available to customers, advisory bodies and consultants and is published annually. It can be accessed at the top of this page under Accreditation Register. The IBO Journal, Organ Building, is also published annually. Each issue contains detailed technical articles, descriptions of new instruments and a review of significant work carried out each year. Our quarterly newsletter contains shorter technical articles, topical information and news of forthcoming meetings. The Institute aims to hold four meetings for members each year. Different areas of the country are visited, and events are hosted by a local organ builder at a workshop or in a church or concert hall; the autumn weekend meeting allows more time for discussion, exploration of different topics or styles of organ building. Details of forthcoming meetings and events can be found using the link above. Do contact us with any comments or suggestions.